It’s July 22nd, and the next version of the awesome Madden franchise — Madden NFL 10 — is expected to drop in about 3 weeks (August 14th). Therefore, you Madden fans out there are begging for the newest features absent from its predeccesor, Madden 09. (However, if your are a true Madden die-hard as I am, you’ll be running home with the latest version anyway). To settle your anticipation, we present to you not the minor updates for basics and rosters, but some of the major updates for the Xbox 360 and PS3 models (updates for the PSP/PS2 and the DS/Wii versions will be posted in the next few days): new cameras, customizable gameplay, Pro-Talk, updates in both gameplay graphics and online play. Curious for more? Go for it– no extra charge. Today, like all days in the world of tech, was very busy, with 2 new phones coming out soon for both AT&T (a cheap model and an amazing camera phone) and T-Mobile (an updated touchscreen and a great texting phone). So what what kind of phones are we talking about here and are they worth checking out? All the answers are a More link away. New Info on BlackBerry Storm 2 Leak Out– Coming to Verizon AND AT&T? Yeah, we all know the first BlackBerry Storm was no where near the quality of other phones like the iPhone, G1 or Pre. But don’t worry Verizon users, as we mentioned briefly in our upcoming Verizon phones post, a newer (and hopefully much better) version of the Storm is coming, and it actually is looking really good. Ok, so what exactly is in this new Verizon version? Boy Genius Report has got a scoop from some of their insiders that not only will the Storm 2 keep some of the good’ol features of the Storm– like Verizon 3G, the 3.2 megapixel camera, and the ability to use 3G GSM networks in Europe– but will also be adding WiFi (it’s about time), BlackBerry OS 5.0, AND a new touchscreen interface (better than the horrific SurePress on the first Storm, and supposedly being a regular touchscreen like the Pre, G1 and iPhone’s, but we don’t know exactly what’s going on there). This version is said to be coming later this year for Verizon. Now you may be wondering, so what’s this talk of AT&T getting a Storm? Well, that according to BGR is also coming soon in the form of an AT&T Storm 2. Not much is currently known of AT&T’s new Storm 2 (though we’d assume it’s got similar features to Verizon’s, just with things like AT&T 3G instead of Verizon 3G), but BGR has confirmed with their sources that a model does exist, and hopefully will be coming soon. Keep those fingers crossed, and we’ll of course keep you updated as soon as we hear anything new. Apple’s App Store Turns 1– What’s your Favorite App? If you haven’t been paying attention to the giant banners in iTunes for the past week (like the one you see above), the Apple App Store for the iPod Touch and iPhone turned 1 yesterday, and Apple is taking the time to celebrate by promoting some it’s favorite apps– both free and paid. Apple’s got a lot to celebrate– 1 billion apps, tons of new iPhones and iPod Touches sold thanks to the App Store, and the envy of pretty much every other cell phone maker– think bout it, because of the App Store, there is now a BlackBerry App World, Palm’s App Catalog, Google’s Android Marketplace, a Windows Marketplace for Mobile (coming to Windows Mobile phones later this year in Windows Mobile 6.5) and countless other mobile app marketplaces trying to get in on the action. But we’re not writing this post just to congratulate Apple, but seeing as the App Store is the most popular of the “App Stores”, we wanna know what’s your favorite apps– whether for iPhone or iPod Touch, free or paid. Me? My favorite apps (right now at least) are ESPN ScoreCenter (free), MLB At Bat (paid version– about $10), AIM (free version), Tap Tap Revenge2 (free), iheartradio (free), and Facebook (free). Sound off with your favorites in the comments. Apple's App Store Turns 1– What's your Favorite App? Meet the Sony Vaio W– Sony’s first venture into the ever growing world of netbooks (ok, in my opinion it’s the second Sony netbook– the first being the Vaio P they announced back in January, though Sony will never admit that it’s a netbook, even though it fits all the netbook descriptions). Anyways, back to the Sony Vaio W netbook. At first glance (as you can see in the pic above) this netbook definitely stands out, and is much more stylish looking than your traditional netbook that you’d find from ASUS, HP, Dell or Acer, instead keeping to the Sony Vaio style even in this smaller, cheaper model. Beyond that nice outside design though, Sony keeps the inside to the standard netbook specs that you find on pretty much every netbook out there: 1.6 GHZ Intel Atom processor, 1 GB RAM, 160 GB hard drive, webcam, memory card slot, Windows XP, WiFi and Bluetooth, etc. It does though have a 10.1 inch HD screen (a resolution of 1366×768– or very good and clear for a 10 inch computer screen, making viewing things like videos and pix much better and easier to do), a “chicklet” keyboard (like those found on regular Vaio’s and MacBooks) which is 86% the size of your standard keyboard, and Sony’s Vaio Media Plus software for streaming your music, movies, and pix to and from the netbook with other PC’s and the PS3. My thoughts on this new netbook? It’s nice, but I personally am not sold on it particularly with it having a smaller than average netbook keyboard (the average netbook has about 92% size of a regular keyboard like those found on normal laptops– and trust me, from someone writing this post on a netbook– an HP Mini 2140– that extra 6% is important, especially when you’re gonna need to write a lot like with notes in school). It also is still a Sony, so don’t expect the price to be so cheap– they’re saying it will be about $500, and you can get a much better deal on a netbook with a better keyboard from one of those other companies mentioned above for well below that $500 price (Best Buy.com for example, has some pretty good deals on some solid ASUS netbooks with pretty close to the exact same specs for only $300). Anyways, if you really want a Sony computer (or a netbook that is really more style oriented than anything else), but never wanted to pay a “premium” price for a traditional Sony laptop, here’s your chance to pick one up when it launches sometime in mid-August in either black, white or pink. 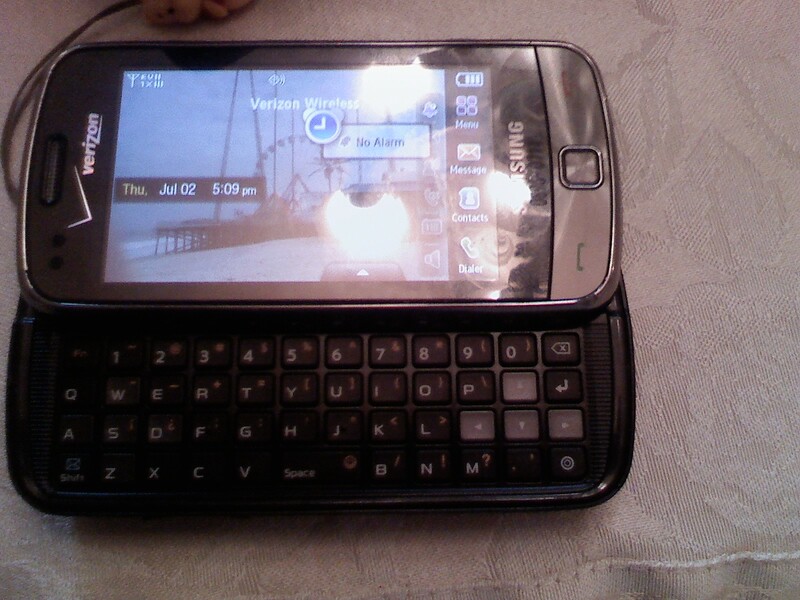 Is this the Samsung Glyde 2? We all know the first Samsung Glyde for Verizon had its ups and downs (looked really cool, but originally the touchscreen stunk, and was so bad that they had to actually recall all the phones to fix it…. ), but now pix are popping up of a new Samsung Glyde 2, and boy does this look to not just fix everything possibly wrong in the first one, but actually do even more! Right now all we got are a couple of pix (like the one you see above), but the phone itself to me looks like a sleeker, Verizon version of AT&T’s very good Samsung Impression (which I have actually seen in person and played with for a couple of minutes– the screen and keyboard on it are AMAZING! ), and that is definitely a very good thing. As I said, we don’t know much yet specs wise but we can safely assume this will be touchscreen (my guess on screen size is somewhere near the Impression’s 3 inches– though that is just my guess, and seeing as this is a rumor, isn’t confirmed anywhere), possibly an AMOLED screen like the Impression (again, just a guess, but could very well be as Samsung has been very big on this tech lately. Oh, and in simple terms– this means an AMAZING screen that is up there with the iPhone and Pre’s), Verizon 3G and Samsung’s TouchWiz interface (both of which we can tell from the pix. And the TouchWiz interface is basically a bunch of cool widgets you can place on your homescreen, it’s definitely nice to have and sure beats Verizon’s standard UI on the homescreen). There also looks to be some sensors like a light sensor by the Verizon logo, which also is a nice touch (though what exactly are the sensors we don’t yet know), and the keyboard looks to be easier to use than the very hard keyed keyboard on the first Glyde. We’ll of course keep you updated on this, but even if the specs are close to what we guessing, then this is looking like another winner for you Verizon users out there. And we now gotta ask, if your looking for a new phone for Verizon over the next couple of months, what ya gonna get– this (basing on the rumored specs and assuming it gets released soon– like in the next couple of months), the BlackBerry Tour, the enV Touch or the enV3? Or are you gonna look for something different entirely? We’re all ears so sound off in the comments. So, you like using Firefox 3 as your browser of choice over other options such as Safari 4, Opera 9, Google Chrome or Internet Explorer 8? Hey, that’s not a bad thing at all and Firefox 3 is my proud browser of choice (I like it a WHOLE lot better than IE8, Safari 4 and Chrome– and I never really got into Opera). I really love its simplicity and speed, and today Mozilla, the guys behind Firefox, today have officially released the next version of Firefox 3– nicely named Firefox 3.5. For all the info on what’s new in 3.5 and for a little first take, hit the more link.